With this Puretec Dual Stage Whole House WH2 Dual Filtration unit you can now ensure peace of mind when using your water. This unit can be used both with mains water and rain water supplies. Even with Australia's high quality standards for mains water, there can be some unwanted nasties left in your water. With this unit you can be sure your family is consuming some of the best filtered water available. With this Puretec WH2 Dual Stage Water Filter you can now ensure that your whole family can enjoy clean and safe drinking water all reay around. Even with Australia's high quality standards for water, there can be some unwanted nasties left in your water. With this unit you can be sure your family is consuming some of the best filtered water available. The WH2 refines the water to reduce build-up in your appliances which can lead to a reduction in their life or a greatly reduced level of performance. Ensure your dishes and clothes are cleaned properly by installing the Puretec WH2! Stage 2 - Active Carbon: Bonded activated carbon to help reduce the presence of sediment, cysts, lead, heavy metal, chlorine and other harmful chemicals and bad tastes. Heavy Duty Housing - The filtration unit comes in a heavy duty casing so you can be comfortable installing it outdoors. 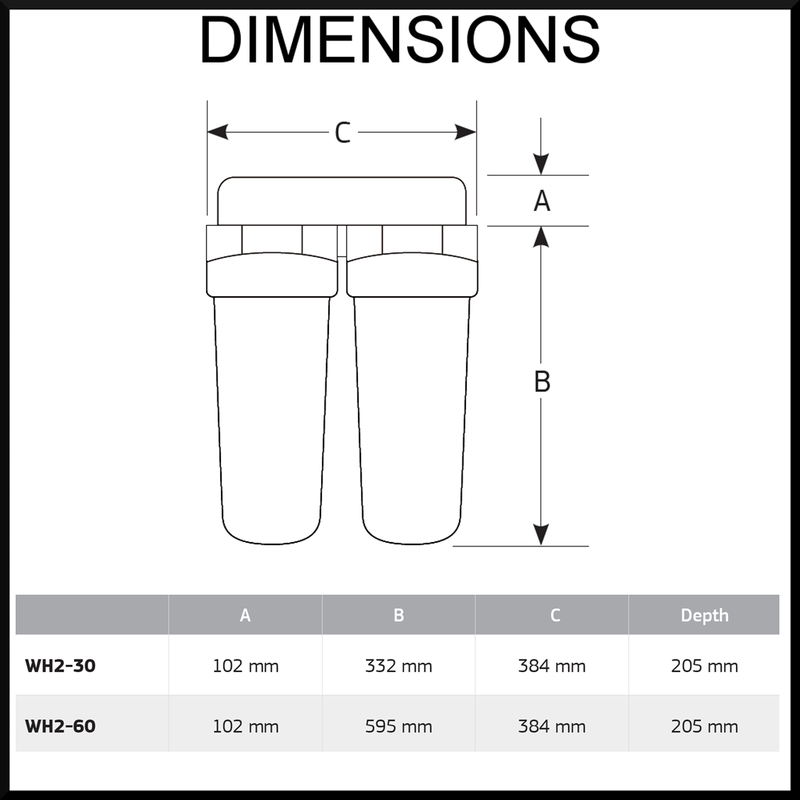 Sediment - you can option for a reusable pleated sediment cartridge (PL05MP1), or a spun polypropylene cartridge (PX05MP1) (that is made to last 3 times longer than comparable cartridges). Important Note: Use only genuine Puretec replacement cartridge. Warranty is 10 years parts, 1 year parts and labour, excludes cartridge.